All eyes will be on Brooklyn, the Barclays Center, and the Championship Rounds of the FanDuel Legends Classic as two of the nation’s most talked about players will face-off on Monday evening. No. 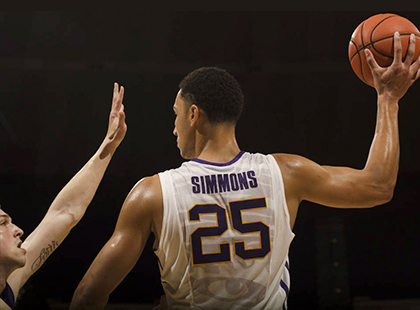 23/19 LSU and freshman phenom Ben Simmons, the projected top pick in the 2016 NBA Draft, join NC State, Marquette, and Arizona State in the Championship Rounds. In Monday’s first semifinal game at 7:00pm (ET), LSU will take on Marquette, which features freshman sensation Henry Ellenson, in a match-up that has drawn 47 pro scouts to attend the doubleheader. That game will be followed by NC State meeting up with Arizona State, two teams also sporting future NBA talent. On Tuesday, the championship doubleheader will begin at 5:30pm (ET). The Subregional Rounds of the FanDuel Legends Classic, featuring Belmont, IUPUI, Kennesaw State, and South Alabama also begin Monday at Bryant. Belmont plays South Alabama and Kennesaw State hosts IUPUI in the semifinals with the championship and consolation games on Tuesday.